Tessa Popoff doesn’t think she is anything special. “I know I am a role model but I don’t see myself as a role model. I don’t think I am all that great,” she said. “I am just an average person making it through life but I know I set the bar for certain people. 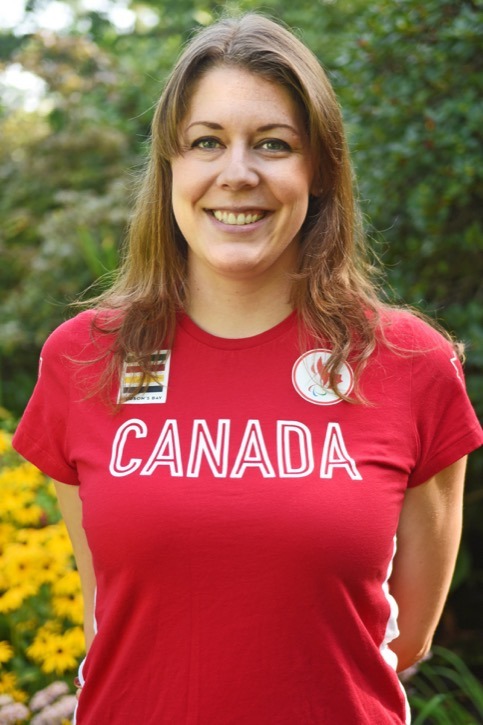 The 31-year-old Popoff is one of a dozen women — and one of two from Langley, along with Danielle Ellis — who will represent Canada in sitting volleyball at the Paralympic Games in Rio next week (Sept. 7 to 16). And this is a long way from where Popoff was when she was 18 years old and had her life changed dramatically. On a road trip with friends, their vehicle failed to navigate a bend in the road, and the car rolled. Sitting in the middle spot in the back seat, Popoff braced herself on the headrest in front of her. The car’s roof caved in and her hand was severed immediately. Of the five in the vehicle, she suffered the most serious injuries, spending a week in hospital and having her right arm amputated below the elbow. But rather than wallow in self pity, Popoff — who was right-hand dominant — set about learning to do things either one-handed or with her left. Two years ago, she also discovered sitting volleyball and in that short time has risen to be among the top dozen from across the country in the game. “It was always a dream, but it is one of those things you never know if it is actually ever going to happen,” Popoff said about being named to the team. Popoff was on the nine-player Canadian side which earned qualification for the Rio Games by winning bronze at last summer’s Parapan Games. But that didn’t mean she was guaranteed one of the dozen roster spots for Rio. The program had 14 players in the mix and the final team wasn’t nominated until early July. “You spend a year and a half, training and travelling with the team and then knowing that your spot can be taken by somebody else, especially with some of the ones who just joined the team this year, who are younger and with more volleyball experience, so it was nerve-wracking,” she said. “It pushed us to train harder, to be the best that we can, knowing that if we don’t push ourselves and train that hard, we can be taken out by someone else. When she was named to the roster, Popoff said it was a sense of excitement, not relief, she felt. Her first phone calls were to her parents, Al Sleighthome and Debbie Popoff. Her emotions got the best of her. Since being named to the roster, Popoff said not a day goes by where she hasn’t thought about Rio. “It is just such an honour to be chosen to represent your country, to wear the flag on your uniform and go compete against the world on national television,” she explained. While she is excited for the Games, it has been a whirlwind past few months, especially since Popoff also owns her own business, the Learning Circle, a Langley childcare centre. She uses her disability as a teaching tool with the children. “I get to show them that if they can’t do it with two hands but I can do it with one hand, then it is not really an acceptable excuse for them and then they try harder,” Popoff said. The majority of her spare time is used to train or stay in shape, playing drop-in stand-up volleyball whenever she can. In the week leading up to her departure for Rio (the players left on Aug. 27) she went every day to see her physiotherapist, massage therapist and/or chiropractor. Meal preparation can also be a challenge, especially when Popoff is shuttling between work, training, or taking care of her daughter, Ella, as she wants to make sure to eat as healthy as possible. None of this could be done without the help of her friends and family. “My whole family has come together to support me. I feel kind of selfish, it really is all about me,” she said. Sponsors have helped as well. Back in April, in the midst of a training camp with her spot still not secured, Popoff’s prosthetic hand snapped in half. But Kintec Footwear and Orthotics, came through and had a new prosthetic ready for her within a week and in time for a tournament the players were attending.